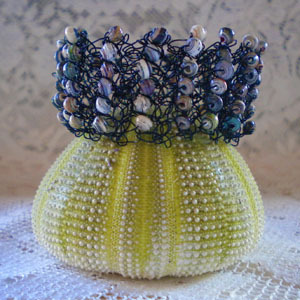 My other passion aside from paper beads is crochet, and I am always looking for ways to incorporate crochet into my paper bead creations or vice versa. I love the lacy look of wire crochet and when I saw the black wire in 28 gauge I thought they would look like black lace when crocheted. 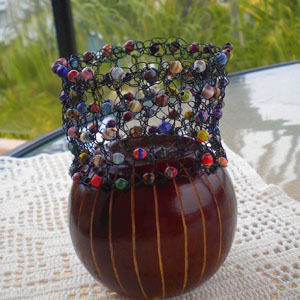 I made the Black Lace With Paper Beads cuff with bright colored paper beads and the Scrunched Up Cuff with magazine color extra small round paper beads. This almost remind me of a hair scrunchie because it can expand to fit over your hand and you can scrunch it up to hug your wrist. No clasp necessary which I like. 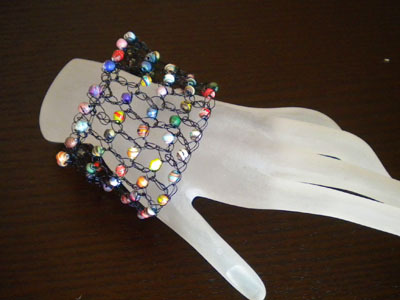 The Black Lace Cuff is more of an open design and looks so pretty on your wrist. This does not have a clasp because it can easily be adjusted to your wrist. 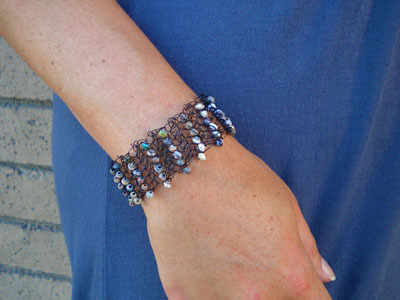 Paper Beads definitely takes this bracelets from ordinary to extraordinary! That is so pretty. I just love it.